If you ever needed a reason to work out, this pre-workout snack is it! These brownies are light, fluffy and sweet. 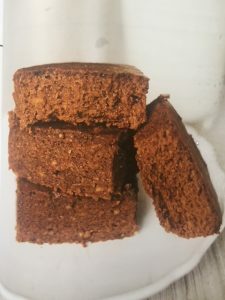 With the perfect combination of carbohydrates, fat and protein, as well as a little kick of energy from the cacao, this snack is not only great for your workout but will also help assist you in a quick recovery. Preheat the oven to 200°C. Bake the sweet potatoes until soft, about 1 hour. When cool enough to handle, peel and mash. Reduce the heat to 180°C and grease a 23 x 33 cm baking dish. Place all the ingredients into a food processor and blend well. Spread the mixture into the prepared baking dish and bake for about 30 minutes. They are done when a toothpick inserted in the middle comes out clean. Once they have cooled for a few minutes, cut into squares and refrigerate. They can be stored in the freezer as well.